Herzogenaurach, June 4, 2018 – Using the world’s biggest moment in sport as the backdrop - adidas has re-engineered the traditional campaign model through personal storytelling, bringing together 56 of the world’s most influential Creators across sport culture, including Leo Messi, Gabriel Jesus, Caroline Wozniacki, Karlie Kloss, Pharrell Williams. adidas believes in the power of an athlete’s imagination and using creativity to make a difference in their game, life and world. In the Campaign titled Creativity is The Answer, adidas aims to inspire Creators across sport culture to be courageous, unexpected and to shape their own reality. adidas has developed its most personal brand experience across mobile, social, digital and broadcast in New York, London, Shanghai Tokyo, Paris, and Los Angeles. Within each of these Key Cities for adidas, athletes will see different and custom content featuring Creators that are shaping sport culture in their city. The story extends through the 56 unique Creator voices on their personal social channels with a range of tailored content – demonstrating how creativity is the difference maker in each of their own games. Viewers are escorted through the backstage for a show like no other. Creators from across sport culture appear gearing up for their unique feats of creativity. José Mourinho directs the backstage, ushering Luis Suarez, Von Miller, Gabriel Jesus, Karlie Kloss and more to the stage. As the show begins, the master of ceremony A$AP Ferg delivers the words that lead viewers through a showcase of creativity. Football icon Paul Pogba is surrounded by athletes who are inspired by his every move and put their own spin on things, spreading a wave of creativity and unveiling the Predator Tango 18+ Street. 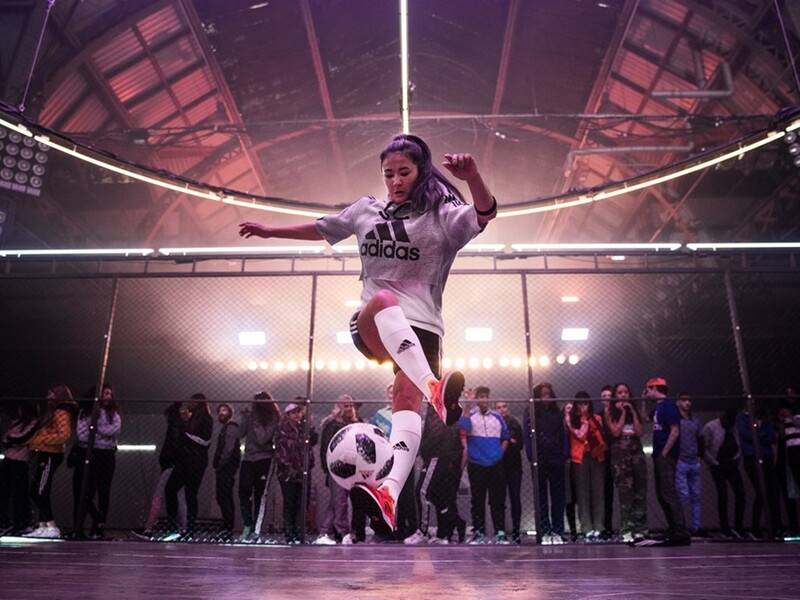 From there, you see two adidas Tango squads playing five-a-side, where Caitlyn Schrepfer, renowned freestyle footballer, uses her creativity to go from the streets to stardom alongside Mo Salah and Dele Alli. Next up, Javier Hernández, Mesut Özil and Lindsey Horan show how sport unites people from all backgrounds, beliefs or gender. In the last act, we see legend Leo Messi, inspiring viewers to throw out the script and make their own rules. The film closes with Pharrell passing the mic to the viewer, a call to all to create the answer. A call to action from adidas to consumers worldwide. Inviting athletes, musicians, artists and filmmakers in adidas Key Cities – London, Los Angeles, Tokyo, Paris, Shanghai, New York and host city Moscow – to co-create and shape the brand narrative for the rest of the campaign throughout the World Cup event. These images, moments and content that adidas and makers create together will form the first ever open-sourced campaign and real-time pulse of the world’s biggest sporting event.